India along with 17 other countries account for 60 to 70 per cent of planet’s diverseness. More than 4.5% of the geological area of India encapsulates approximately near about 80 National Parks and 500 Wildlife Sanctuaries. There are approx 400 species of mammals, 1200 species of birds and nearly 500 species of reptiles. From Kashmir to Kanyakumari, the country has well classified species of wildlife that include some of the atypical species that are found only in India like the Great Indian Rhinoceros. There are many national parks & wildlife sanctuaries in India. Well! not every national park is known for the majestic tiger, Kaziranga National Park in Assam is known for its one-horned rhino rather than the tiger. Every national park is known for their unique quality of flora and fauna. Hemis National Park, located in the northern region of Ladakh is known for its Snow Leopard, while the Bandhavgarh National Park in Madhya Pradesh is a home to the splendid white tigers. The Bandhavgarh National Park is the only place where one can witness the white tigers in their natural habitat. Each of these national parks is a success story of conservation of wildlife in India. The Kanha National Park also in Madhya Pradesh is known for its ever enchanting topography along with the sighting of the Royal Bengal Tiger. It was Kanha that inspired Rudyard Kipling to compose the “Jungle Book”. Corbett National Park needs a special reference. It is the first national park of the country. 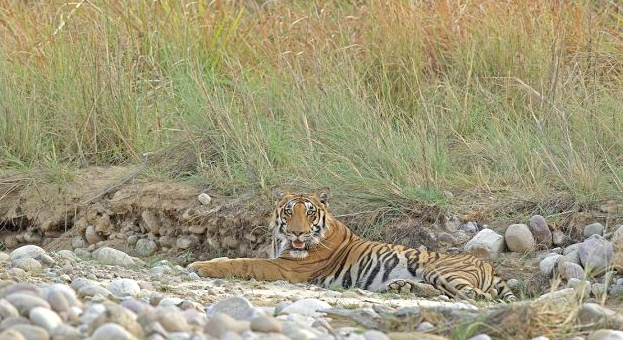 It was Corbett, which was the preliminary Tiger Reserve and from here the revolutionary ‘Project Tiger’ started. It is one of the most visited national parks in Uttarakhand. Talking about exotic wildlife of India, Asiatic Lion, the most magnificent creature ever, is found in the Gir National Park in Gujarat. Gir takes you back to the ancient times when the lions and humans used to live in the same vicinity. This is the only national park in India where you can see these huge cats in their natural environment. The bird watchers need not complain, as the Bharatpur Bird Sanctuary in Rajasthan is one of the best bird sanctuaries in the world. Apart from this, Bharatpur is also listed as one of the UNESCO World Heritage Sites in India. The Flamingo Colony of Khavda in Gujarat, as the name suggests, is the place to fly with the flamingos in India. There are many birding paradises in India that require a special article upon them. India has almost one national park and wildlife sanctuary in its every state. Even the two islands of India, Lakshadweep Island and Andaman & Nicobar Island are too wildlife laden areas. The Lakshadweep Island is known for its leather back turtle and the Andaman & Nicobar for its Olive Ridley. There are number of crocodile species thriving here. Around 1300 varieties of plants, trees and herbs are found in Lakshadweep Islands alone. It is a fact now that the Indian Wildlife is truly majestic and assorted and watching this wildlife in its natural surroundings is truly a delight to the eyes. Click here for best travel packages of Corbett National Park.